Petah Tikva residents help plant communal garden in Negev community under attack by arson kites and balloons from Gaza terrorists. 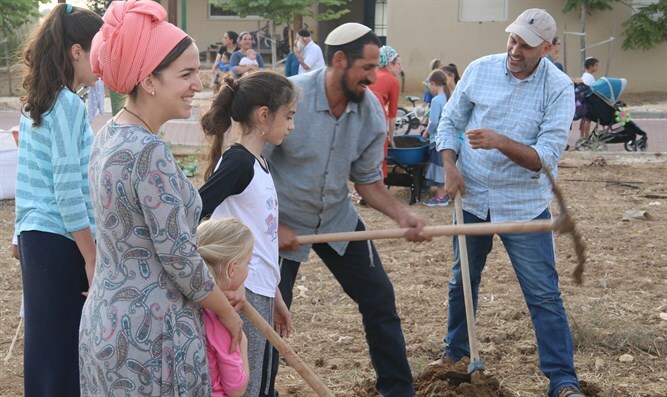 Members of the Oz Vehadar community in the Hadar Ganim neighborhood of Petah Tikva went down to Moshav Shuba in the Negev on Thursday to take an active part in a planting event and set up a communal public garden in the moshav. The trees that were planted were bought from the Jewish community's fundraising campaign for the moshav. The guests from Petah Tikva emphasized that the planting of the trees and seedlings came as a response to the terror attacks that have plagued the area for the last four months. "In a place of destruction and destruction, we want to grow again," said Aviat Laufer and Anat Statler, who initiated the volunteer work. "We came to you residents of the Gaza vicinity, with seedlings and a warm embrace from the center, to say simply that we are with you." "The event was carried out with the help of Petah Tikva Mayor Itzik Dayi, chairman of the Jewish Home in the city," emphasized Laufer. "We are all praying that the communities surrounding the Gaza Strip will soon enjoy real quiet and that all the blackened land will quickly become green again." The activity was carried out in cooperation with the Shabeh Group, a community-based community organization that joined and joined the veteran Moshav of Shuba nine years ago. "The organization is active in education and the environment," said Aharon Ariel Lavie, a member of the group. "We joined the community of Oz Vehadar from Petah Tikvah and held the event together with the veterans of the moshav, in the presence of the head of the council, Tamir Idan. The garden is named after Tita Montin, a rare woman from the founding generation who passed away a year ago." "After four months of fires, we want to bring the green back to our eyes and show that resilience is an active thing," Lavi concluded.